Key is Moderation-Keep mom-to-be moving. Read my post on the ACOG’s newest exercise considerations-It’s a Win for us! Check out our Easy Reference Guide to see if it can help you! 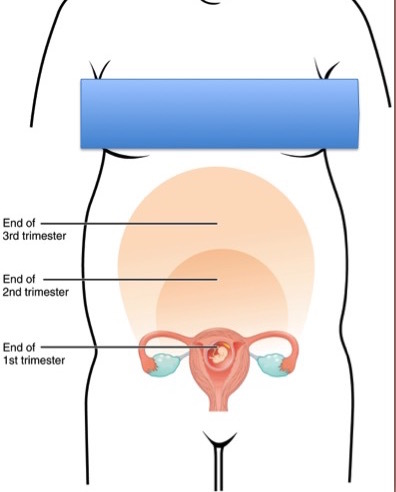 The First trimester is the most vulnerable stage of pregnancy. Miscarriage is most common during this stage. It is also when the body begins to rapidly change, being flooded with pregnancy hormones. Nausea and fatigue are common, but exercise can help reduce the severity of these symptoms. The second trimester is considered the most comfortable stage. The body has become adapted to the hormonal changes; nausea and fatigue have usually subsided. Mom feels great and energetic. The 3rd trimester is where mom starts to become uncomfortable, especially towards the end of the pregnancy, due to how big her uterus has become – from the size of a lemon to the size of a watermelon. It is crucial she continues to exercise, even though she may not feel like it.